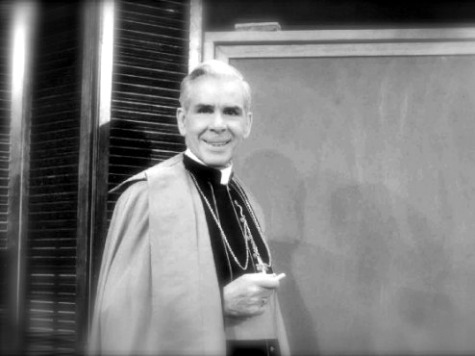 For a time in the 1950s, Bishop Fulton Sheen was one of the biggest television stars in America. His prime-time show “Life is Worth Living” had one of the biggest audiences in TV history. He went up against Milton Berle and sometimes won. As Breitbart News reported last April, the cause for his canonization, the process by which the Catholic Church recognizes a person is in Heaven and names them officially a Saint, was begun some years ago, and in recent months picked up speed, as a miracle was attributed to Sheen’s intercession. To be “beatified,” the final step before official canonization, the candidate must have a miracle attributed to his intercession.